In summary, the research brief from Southern Tablelands Arts (STARTS) was to provide historical background and personal stories to inform public art work at Goulburn, Moss Vale and Picton railway stations that would honour and reflect the coming home experience of First World War railway worker veterans. It included the provision of local workshops with STARTS to share stories of the experiences of veterans of the aftermath of war. Discussions about the research with STARTS highlighted the value of a project that would link several Local Government Areas in the STARTS region. They also highlighted the potential for the material collected to provide a basis for future activities generated by STARTS or other interested organisations (eg Rocky Hill Museum). The material in this report focuses on the experience of World War One veterans who returned to work on the Great Southern Line or found employment on it after their return. It includes personal stories gleaned from archival records as well as family memories. Relevant information from a range of primary and secondary sources extends this material by providing important insights into the personal experience of working on the Great Southern Line, enlisting and returning home from the front as well as a grounding in place and time. The breadth of material is intended to function as an informed basis for specific ideas for the present public art project and for future projects. Potential images and themes for the public artwork are highlighted through the report but it is expected that the artist will also respond to the wider information. Community members were a vital source in the quest for stories. Their interest, memories and memorabilia made a powerful contribution (appendices I; i(a); i(b) Memories and memorabilia spreadsheet; stories workshop flyer; memories and memorabilia consent form). There was strong community participation in Goulburn where the railway has had a significant long term role in community life and where there is a railway as well as a war memorial museum, an active band of museum volunteers and a professional museum officer employed by the Goulburn-Mulwaree Council. The process of seeking out family members in Moss Vale and Picton through broader research networks continues and it is anticipated that the artwork itself will prompt further interest and engagement. Wider historical research sources were archives, other researchers and secondary sources. Employment and war service records provided insight into individual experiences of war and railway work. Newspapers of the time often filled out aspects of the individual’s community and family life. Australian Railway Historical Society (NSW) records and railway union records were particularly useful in providing context for the personal experience of working on the southern line, enlisting and returning to work. Railway war researcher Trevor Edmonds was generous in sharing his sources and papers. 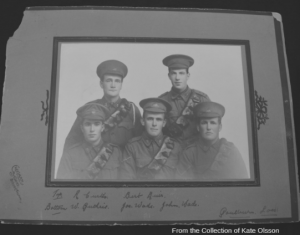 Researcher for the exhibition The Southern Highlands 1200, Linda Emery provided similar assistance as did the Wollondilly Heritage Centre, particularly through Doreen Lyon and the exhibition, Her War. The period of time researched was primarily 1914-1920s but included material about NSWGR and social life (eg the Great Depression) into the 1930s. I have checked my understanding of information about working on the Southern Line as far as possible. Queries about NSWGR organisational information would be best answered by Trevor Edmonds. The Great Southern Line was part of the huge network of New South Wales railway lines managed by the New South Wales Government Railway (NSWGR). NSWGR was one of the world’s first state-run railway corporations and played a vital role in the state’s agricultural and industrial economies well into the twentieth century. The organisation was established as a commission in 1855 and by the time of the First World War, was managing 3930 miles of railway track (Bulletin in Gunn 274), as well as maintaining and manufacturing locomotives and rolling stock. At this time it was also responsible for tramways. It employed 45,000 people. The Great Southern, Northern and Western lines and their extended branches were built during the 19th century. In the early 20th century the suburban network was expanded while country railway construction into the 1920s focused on duplications, deviations and additions to address inadequacies (Gunn 271). The grand role of NSWGR continued until well after the Second World War with the workforce swelling to 56,000 in the 1950s to make it ‘Australia’s biggest business’ (McKillop) despite the rise of road transport. The system of a commission responsible to the government took various forms until 1972 when a single Public Transport Commission was established and the State Rail Authority became an entity within it. The NSWGR workforce was managed on the basis of a strict bureaucratic hierarchy. Bob McKillop describes it as ‘a gigantic paternalistic organisation in which the chief commissioner was the “big daddy”’. Authority operated from the chief commissioner, through divisional heads, to departmental heads and through a further chain of command to the most junior and lowly levels. Work was carried out according to highly detailed rules and regulations for specific positions. The chain of command kept a strict eye individual performance. Passing tests on rules and regulations as well as technical requirements was the basis for promotion according to a set scale of seniority. It often meant a move to another location. Poor work performance could lead to stepping back in seniority through reversion to a lower position and pay rate. This ‘punishment’ might be preceded by a warning, then a caution, then a reprimand – depending on the severity of the issue. Punishments could be appealed and the relevant union usually played a role in taking the appeal to the Appeals Board. Railway workers were paid for overtime above the 8-hour day and had access to the NSWGR superannuation fund which most of the men in the stories joined as soon as they were permanently employed. The retirement age was 65 and a means tested government age pension was available for men over this age. A government invalid pension for disability was also available. Permanent employees were often initially employed on a casual basis and permanent employment began with a period of probation. Employment records show that there were allowances for working outside in all weathers. In difficult economic times, including during wartime and the Great Depression, casual employees were the most vulnerable to losing their jobs and permanent employees could be put off on holidays and often had to work short hours. Strikers could also lose hours and seniority. Many railway workers belonged to trade unions and work associations. There were unions for many trades and grades of work and a certain competition between them as well as continuing attempts to work together and to cover a wider range of workers (eg the All Grades Railway and Tramway Service Association which became the Australian Railways Union in 1920). Another important railway workers’ union was the Australian Federated Union of Locomotive Enginemen which many Loco workers belonged to. Unions supported railway members’ appeals to the Commissioners about pay and position and worked for better conditions and wages. During the War they took up cases of railway employees experiencing difficulties with enlisting – eg ensuring they received the difference between work and military pay. The All Grades set up a War Distress Fund which include funds for men/their families who lost jobs because of the war and a contribution to hospital accommodation overseas and support of wounded railway workers. After the War they sought to ensure equity for their members in a context coloured by the impact of the 1917 strike and returning soldiers. Southern Division stretched from Sydney to Albury and as far west as Narrandera and Griffith. Goulburn District Loco Department was responsible for relevant activities at stations from Moss Vale to Cooma. Sydney Loco, through Enfield, was responsible for Picton. It is understood that other departments such as Traffic and Per Way were organised on a similar district basis. (Based on 1931 organisational structure – probably no dramatic changes from 1914. See appendices vi – Loco Sydney- and vii – Loco Goulburn)). Employment cards show that railway workers moved to other locations on the Line and to other Lines in response to job vacancies and that this was often necessary for promotion or a result of demotion. Those involved in driving trains regularly travelled between locations along the Line and gangers and fettlers could work at a number of locations along the Line within their district. During the War duplication and deviation works were carried out around each of the hubs. In the Moss Vale region the development of fruit trade was referred to in relation to the achievement of greater efficiency. The works brought numbers of workers, accommodated in work camps, into the localities, where, especially around smaller centres like Moss Vale and Mittagong, they played an important role in town life and were farewelled when they enlisted, and acknowledged as generous donors to war fundraising efforts (local newspaper reports). At Moss Vale the works included remodelling of the station and improvements for traffic management and ‘additional conveniences’ for passengers. How does an interested person become registered as a user of this website? I have collected a considerable amount of material on some of these Railwaymen / Soldiers, and may have additional notes on people you have not mentioned. I have an extensive private library of Railway History and am an experienced researcher on both Family, Industrial and transport topics. and several other similar bodies.